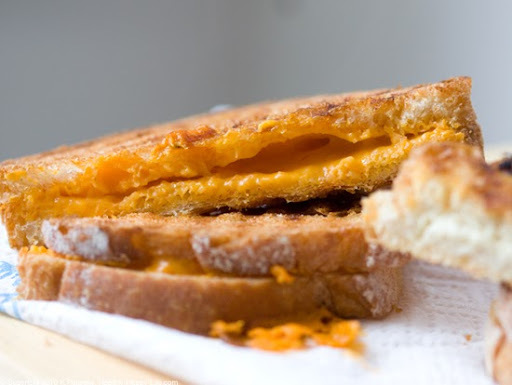 Vegan Grilled Cheese. Daiya. FYH. Bread. 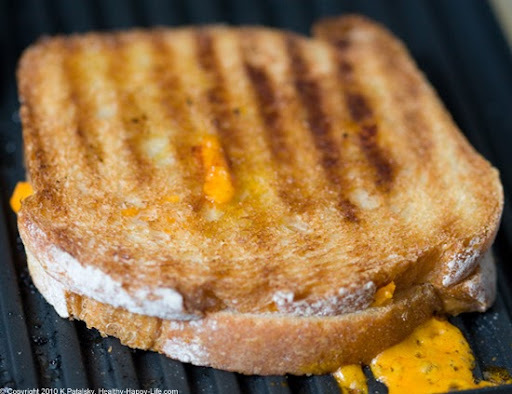 Step-by-Step..
2) A buttery warm grilled cheddar cheese sandwich. Cut into triangles. Crusts on. Flash Forward to adulthood. Kitchen. Lunchtime. I'm slathering almond butter, apricot jam, sliced bananas and cinnamon onto toasted spelt or sprouted grain bread. Crusts on. Side of ice cold vanilla soy milk - dash of cinnamon and nutmeg stirred in. PBJ's transition from kid food to adult food: seamless. Soy Cheese. A History. Like I said, vegan cheese was pretty bad for a good few years. 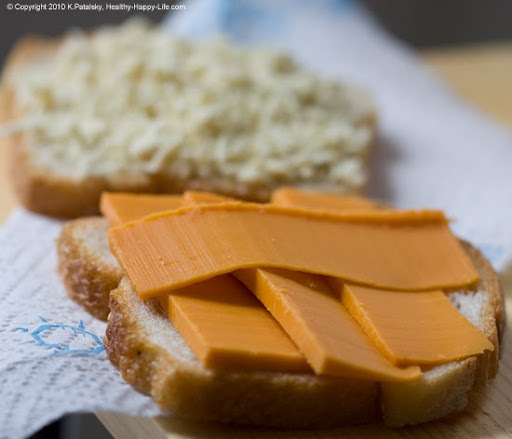 I remember years ago experimenting, as a vegetarian, with this new crazy food called "soy cheese". It came in several flavors. I decided I liked the Spicy Jack Soy Cheese the best. It melted like a dream. Yippee. I felt empowered. I brushed aside my once-beloved Brie, Munster and Swiss dairy cheeses. Who needs dairy now?! This soy cheese is perfection! With the "soy cheese" I made pizza, grilled cheese sandwiches, and even those 1990's English Muffin Pizzas with pizza sauce and some soy cheese - into the toaster oven on broil for ten minutes. Then I started reading. Magazines, books, food labels. Ingredients: casein. Huh? "What is 'milk-derived' casein doing in my soy cheese? Wouldn't that defeat the point of...." Like most, I was perplexed. What's the point of soy cheese if it still contains dairy? Well now I know that casein is a milk-derived ingredient that is added to many soy cheese varieties. 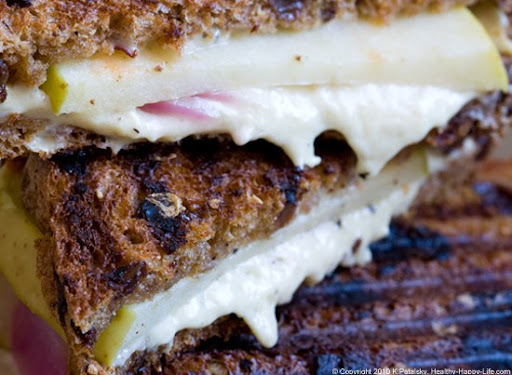 The casein allows the cheese to do what all cheese should do: melt. However, soy cheese containing casein is not vegan. I had embraced casein-containing soy cheese for a while - but as I read more and ate more and listened to my body more - I decided to nix the dairy from my diet. And that meant tossing fro-yo, milk chocolate, whipped cream, dairy ice cream....and soy cheese with casein. Goodbye grilled cheese. I then experimented with every type of casein-free vegan soy cheese you could find. #FAIL. Almost all of them failed to pass the "melt test". Cheeseless me. Flash Forward to now. Hooray! 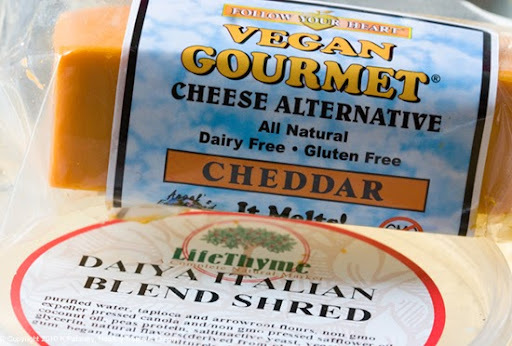 Vegan, meltable, yummy, cravable, versatile cheese is alive and well thanks to me two favorite brands: Daiya and Follow Your Heart. No, it is not exactly the same as dairy cheese - but I love it. 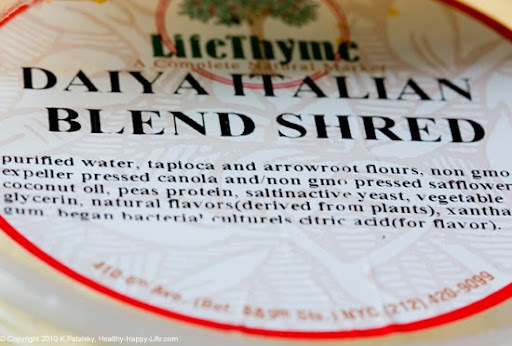 When I'm craving a melting cheese accent to my recipes, a tiny sprinkle of Daiya or a sliver of FYH will satisfy that craving. I'll admit when I first discovered Daiya cheese pizza I was craving it every night (from Pala pizza here in NYC). Too much of a good thing and I had a Daiya-overload. Do not do this. I felt like a kid trying chocolate for the first time. But be an adult, and manage the vegan cheese cravings well - everything in moderation - including cheese. The vegan label doesn't give you a free-for-all eating pass. SIDENOTE: My other all-time fave vegan raw cheese is tree-nut cheese from folks like Dr.Cow. 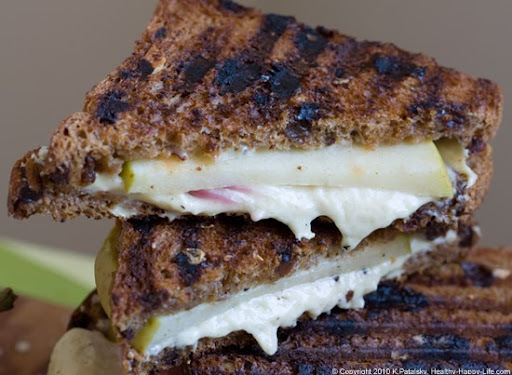 I have not tried a Dr.Cow tree-nut grilled cheese sandwich. I imagine it would be delicious - but very expensive! For salads and cheese 'n crackers I adore Dr.Cow - more info here. Daiya Cheese. Melts into a gooey slick-taffy-like consistency. Kinda like mozzarella. Perfect choice for pizza and...grilled cheese sandwiches. It has a slightly milky texture to it which deserves a taste test. Are you a Daiya fan?? Follow Your Heart Vegan Cheese. FYH melts very well at high temperatures. And the flavor of the Monterey Jack is my amazing - my favorite. I actually use the Monterey Jack flavor instead of the Mozzarella flavor on my FYH vegan pizzas. FYH is more widely available than Daiya cheese right now. PART TWO: Bread. Have you ever seen Shear Genius on Bravo where they end each show by saying "Hair. Is important." Well my slogan for grilled cheese making, "Bread. Is Important." The cheese shouldn't be the star of the show. Yes, I'll say it again. Cheese shouldn't be the star of the show. It's all about bread quality and flavor. 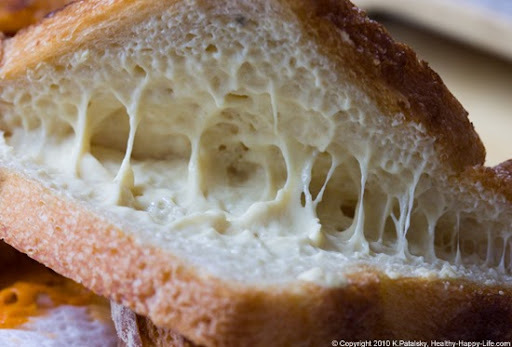 If you have great cheese on crummy bread, you've #failed. *Choose bread that is hearty enough to stand up to the grilling process. A fluffy white bread will usually wilt or burn on an at-home grill. *Grain, dried fruit or seed containing bread is a nice touch because the toasted bits bring out warm complex tones in the bread. *Slice your bread thick enough so that there is a nice two-tone texture in the final product. You want a crunchy outer crust while maintaining some moistness on the inner layer of the bread. A cracker-crunchy end product sandwich isn't ideal to most. *Don't slice too thick though. You want the bread just thin enough so that the cheese can melt properly. *Bread from a professional baker is my favorite. I love using Amy's Bread, Black Rooster or Sullivan Street here in NYC. Something with a hearty crusty. Amy's fennel seed, golden raisin, cornmeal crusted = yum. Or walnut whole wheat. But FYI, day old bread is very grillable, just watch out for dryness. The great thing about grilled bread is that it doesn't have to be 'fresh-baked' bread. *ideas: spelt, whole wheat, baguette bread, sourdough, cinnamon raisin, Country white sliced thick, rye, potato, thin bagels, seeded multi-grain, pumpernickel, ciabatta or one of my healthy faves: sprouted grain bread. *Nothing. Keep it dry and hope for the best. *Vegenaise. Just a very light spread on the outer sides of the bread will do it. *A light spread of vegan buttery spread. I very often do the 'dry bread' grill and it actually works out just fine on my panini press. PART FOUR: Tools. I use a panini press. But you can use a wide saute pan, stove top grill or even backyard grill. Read all about my tools advice in Grilling Guide 101. You'll want to have a nice wide spatula around as well. 1. 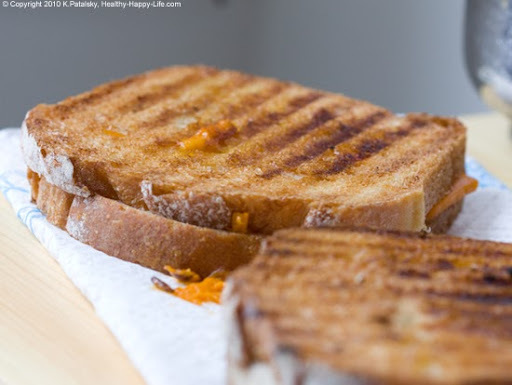 Turn on the stove or warm up the panini press and grab the ingredients. Bread, cheese, optional 'spread' and other optional ingredients. 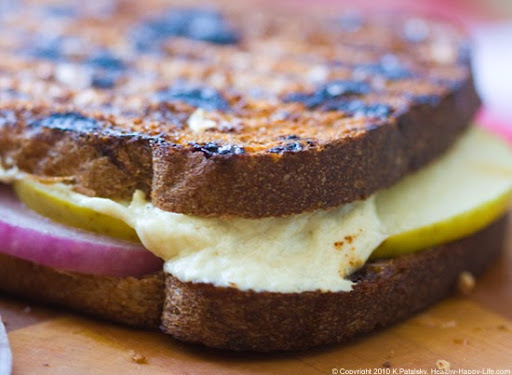 There are thousands of different grilled cheese ingredient combos - but lets start off with a basic cheese and bread sandwich. 2. If using a spread, apply it to the outer sides of the bread now. 3. Place the first slice of bread - spread side down - on your grill. Add the cheese quickly, trying not to spill it onto the grill. 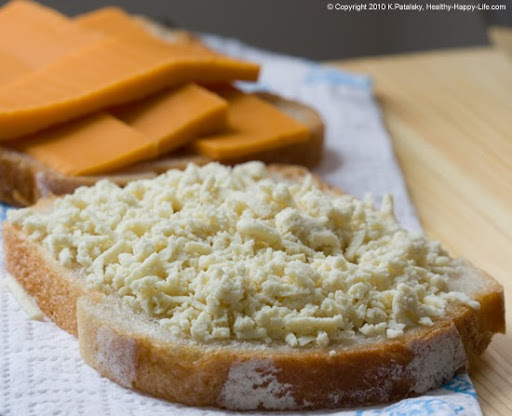 Note: you can use thinly sliced cheese or traditional grated cheese. Grated cheese melts fastest. 4. 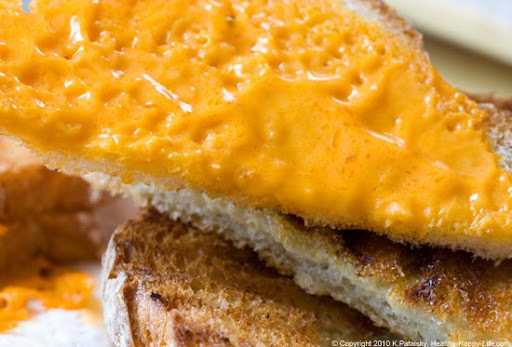 Place the top layer of bread over the cheese - spread side up this time. Close the panini press with a firm press. If using a basic saute pan, you'll want to press down on the sandwich firmly with a spatula. If using a basic pan - you can cover the bread with foil to crate some intense moist heat that will melt the cheese faster without drying out the bread too quickly. When the cheese is melted, remove the foil to get that final crisp outer layer texture. 5. 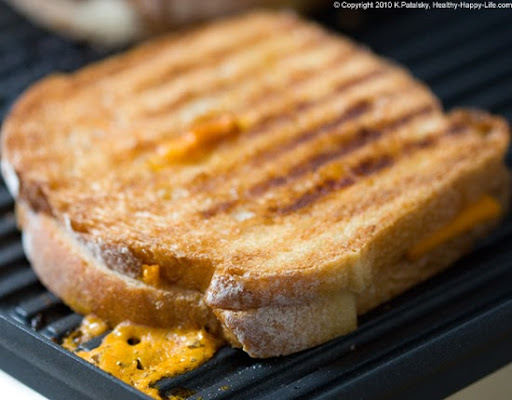 Grilled cheese sandwiches take anywhere from 2-5 minutes, depending on the tools and ingredients you are using. 6. Remove sandwich from heat. Place on flat surface to cool for about a minute. 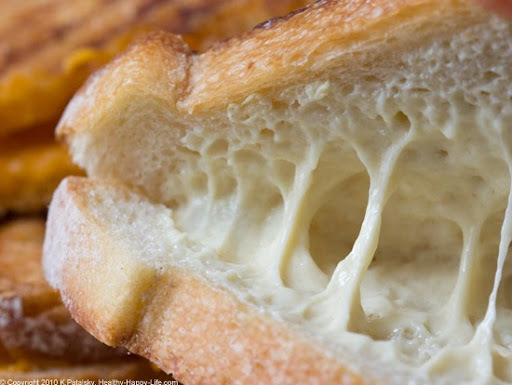 Remember that some of the cheese will continue to heat and melt a minute or so after the sandwich is removed from the grill - so don't burn the bread just to over-melt the cheese. Slice. Serve. My number one tip: practice makes perfect. And experimentation is king. Try out a few different varieties of bread, combinations of cheese flavors, thickness slices in the bread, spreads and tools. Discover what you like. 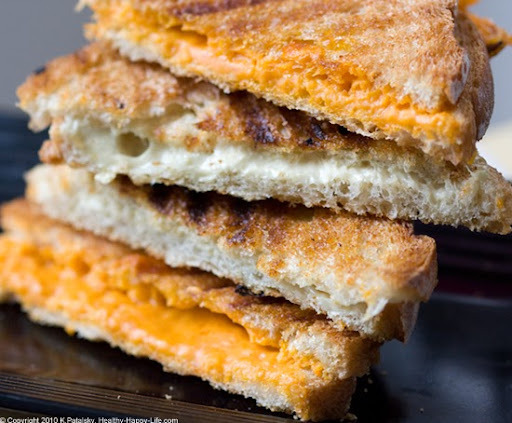 Everyone is different..
Grilled cheese is a very personal thing. I like my grilled cheese super moist on the inner layer with accents of fresh basil and black pepper. Sometimes a hint of spicy harissa. On thin sliced grain/seeded bread that crunches on the outside - while staying soft and chewy on inside. But that's just me. How do you like your grilled cheese...?